We made wands today (instead of buying them at the shops). Easy, fun and probably just as long-lasting! Previously... Where do babies come from? More recently... Where to start? Aisha looks so pretty and pleased with her creation. got to write down how u did it. what material to use, etc. this is the most pretty and happy photo of Aisha i’ve ever seen. 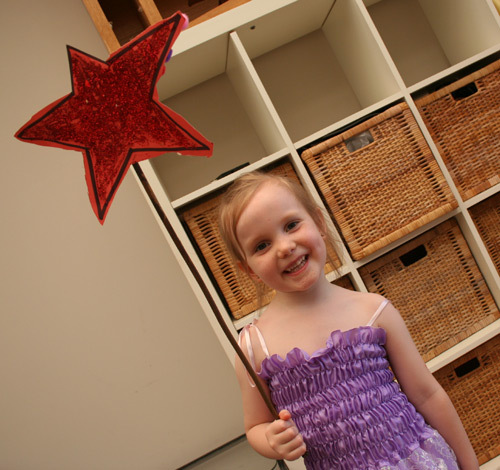 We cut the star out of red card paper, and spread glue on it, then sprinkled red glitter over it. For the stick, we found one in the back yard and just stuck it to the back of the star with a couple pieces of sticky-tape.